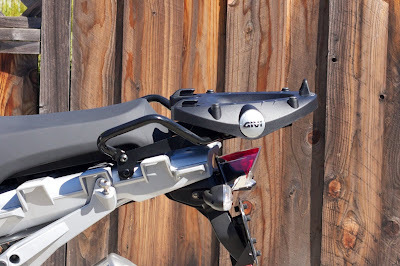 After I sold the MC Products Low Mount Rear Rack I immediately ordered a Givi SR689 rack. This is Givi's rack for installing top cases on 2007 and newer R1200GS. At least that's what Givi says, but from what I read it fits all R1200GS from 2004 and on. Don't rely on me though, I haven't tested this, just read it online. It mounts pretty low as it replaces the OEM rack completely and does not sit on top as the older Givi rack or the BMW for the Vario top case does. It has grab handles at the side. They are even removable, but I need them to push the bike around, therefore, they stay on. It was a fairly simple installation, I took my time to get everything right though. Took about 30 minutes to install the base to the bike and the plastic / nylon plate to the base. Not complicate, just quite a few bits and pieces. The first impression is that the quality is not even close to the MCP rack. The screws are black, but the color is already wearing off on some, the powder coating is okay, but not excellent and I have no idea why those strange Italians make the handles a kind of glossy powder coat while the base is matte. I would have preferred everything matte. I can't say the quality is poor, but I think it's just above poor. Average on the low end of average. In a few days I'll probably take the screws out that hold the rack to the bike and add some Loctite Blue, but so far, there was still so much thread locker in there that I didn't want to add more. So far it looks okay, not really good, but definitely usable. In the next few weeks I'll decide on a case to use and order it. 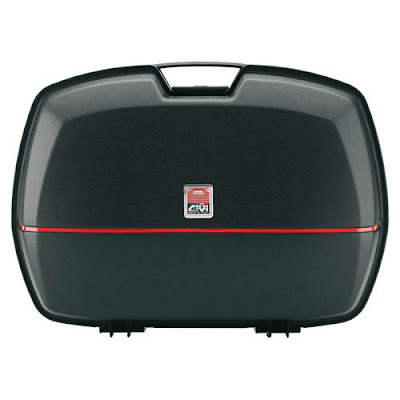 The classic Givi Case - E45N. Ugly, boxy, stable, waterproof, cheap. Available for $140 at some places. 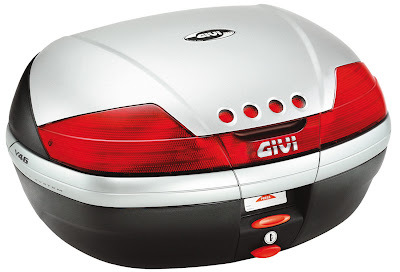 The Givi V46 is much more modern than the E45N, looks better, has slightly better aerodynamics and the option of adding brake lights. I would get it with a flat black top as the colored ones scratch to easily. The Maxia E55 is massive. It holds 55L, which is 9 or even 10 more than the previous ones, it's the only one of the three to easily take two full face helmets, or one helmet and a jacket and other stuff. Light can be added as well as a foam liner. The downside is that it's freaking huge, has a new closing mechanism that is just not as stupid simple and fool proof than the old one and it is kind of heavy on it's own. And with around $300 the most expensive of the three cases mentioned so far. The option of storing two full face helmets makes it still the most interesting one so far. It's cheap (~ $90), but very, very tough. Really hard to break. Small and light. With 2.7kg it's close to half the weight of the other cases. Can take plug foam to store a camera / lens kit properly. 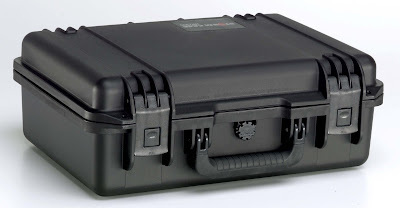 For my normal storage needs while riding, this case is more than enough. I need some space for a small camera, some food, water, small rain pants, second pair of gloves and maybe some other small items. It's just not as convenient as the Givis because when parked it can't take a helmet or jacket. And this is not unimportant as I like the convenience of not carrying the helmet around all the time quite some. 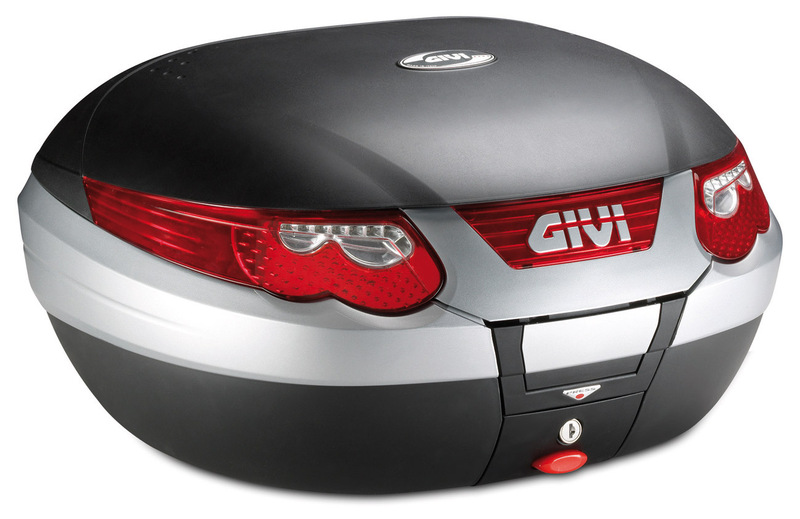 I might get a Givi and the Hardigg - the second one is cheap enough to just get one and install it when it's the right thing to use.